If you're struggling with debts spread across multiple credit cards and other types of unsecured debts, you're not alone. Many California residents and consumers all across the country are also overwhelmed with credit card debt due to any number of reasons, such as unemployment, medical bills, or unexpected personal hardships. The good news is, help is available. Many consumers have found relief from their debts thanks to a variety of debt relief options, including debt consolidation loans, debt management plans coordinated by credit counselors, debt settlement or debt negotiation, and even bankruptcy. If you are struggling with credit cards and other unsecured debts, find out how debt relief plans may be able to help you resolve debts in an easier and more predictable way, and at a pace that you can afford. Get your free debt relief evaluation and savings estimate. The goal of debt consolidation loans is to combine or "consolidate" multiple high interest rate debts into a single, lower interest rate loan. In theory, the consumer takes the proceeds from the consolidation loan and pays off high interest credit cards, then only has a single, lower interest rate debt consolidation loan to pay off. For some individuals, this method works depending on a variety of factors, including the type of debt they have and the terms of their loan. But a debt consolidation loan is certainly not a method that will work for everyone. There are times when it may not be the best course of action to take "unsecured" debt such as credit cards and convert that debt into a new loan that is "secured" by a home or other asset. Why? Because if consumers hit a rough spot financially and fail to live up to the terms of their debt consolidation loan, they could be putting their home or other asset in jeopardy. In addition, many consumers who take out debt consolidation loans do indeed payoff their credit cards, but then end up accumulating a whole new batch of credit card charges. Now, there's the responsibility to pay off a debt consolidation loan AND a new round of credit card charges. In this scenario, which unfortunately is very common, the consumer's debt crisis has gone from bad to worse. If you are considering a debt consolidation loan, first take a moment to find out how a structured debt relief plan may be able to help you resolve debts faster and save money. Simply answer a few simple questions and get your free debt relief evaluation and savings estimate. Debt management is a popular option among many consumers who are looking to get relief from high interest credit card debts as well as other unsecured debts – such as utilities, department store charges, gas cards, or even medical or doctor bills. With debt management plans or DMPs, consumers seek to combine multiple debts into a single, more manageable, and more predictable payment plan made to a credit counseling agency, who then distributes the monthly payments to creditors month after month until debts are resolved. The goal behind a debt management program coordinated through a credit counselor is for the debt counselors, working on behalf of consumers, to contact credit card companies and get them to accept proposals and agree to extend the benefits of debt relief to consumers who are experiencing a financial hardship. These benefits typically include lower interest rates, a waiving of late fees and penalties, and a more manageable and more structured monthly payment plan. 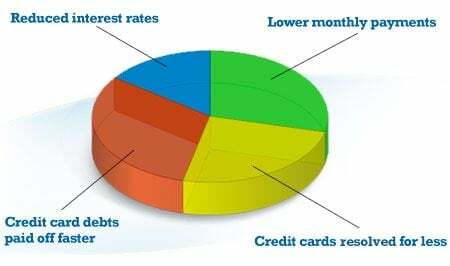 When the consumer stops ringing up new credit card charges and begins to pay down debts month after month on time, at lower interest rates, the process of debt resolution becomes more structured and more predictable. While debt management plans do not make debts magically go away, they can be very effective for some and save a substantial amount of money if followed faithfully. Overall, they are an honorable way for consumers to resolve debts and fulfill their financial obligations as promised. If you are interested in seeking debt consolidation options or a debt management plan with help from a credit or debt relief counselor, take a moment to find out how debt plans may be able to help you resolve debts faster and save money. Get your free debt relief evaluation and savings analysis today - at no cost to you. While debt relief programs help many Americans during times of financial hardship, others may need more immediate relief, such as help paying for utilities, rent, childcare or even buying groceries. The state of California has a variety of financial assistance programs available, such as The Low Income Home Energy Assistance Program (LIHEAP) or the California Transitional Assistance Program. To find out more about these programs and related services, go to the state's homepage and click on the Benefits page. Another popular debt relief option is debt settlement, also referred to as debt negotiation or debt mediation. The goal of debt settlement is for consumers, through a debt negotiator, to get individual creditors to agree to "settle" debts for substantially less than the full amount owed. Debt settlement typically involves the process whereby consumers in distress stop paying high interest credit card minimums and instead begin to "set aside" those monies to be used for the purpose of extend a debt settlement offer, through a debt negotiator, to a credit card company. It's important to know that debt settlement, while increasingly popular as an alternative to personal bankruptcy, is an aggressive debt relief option. Consumers should understand that when they stop paying cards according to the terms of their agreements, creditors can threaten or take legal action. In addition, money that is saved by settling for less is subject to taxation. Finally, debt settlement will normally have a negative impact on personal credit, but not as serious or long lasting an impact as personal bankruptcy. 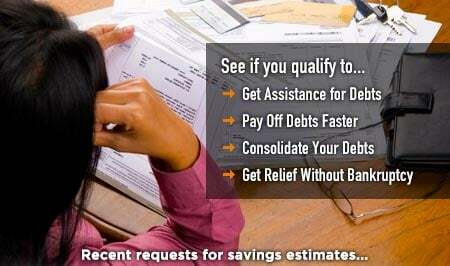 If you are struggling with credit cards and other unsecured debts and in need of debt relief assistance, simply answer a few simple questions and get your free debt relief evaluation and savings estimate.